LOCATION, location, location. This location can't be beat! We are in "el centro." It is a short 5-6 minute level walk to the "jardin," the absolute middle of town. We have two very beautiful private suites (actually they are studio apartments) that overlook a flower-filled garden. Both suites have incredible bathrooms made of Mexican tile. light cooking. Electric coffee pot. Purified water in the pipes! Luxurious bathroom with blue and white Mexican tiles. Wirelss internet. Mexican cable TV. DVD with large collection of DVDs. Spacious and filled with light. Two full walls of glass windows overlook a flower-filled garden. People describe the garden as "Giverny comes to Mexico." In the vacation rentals site that you are now on, there is no option for "suite." Thus I choose "apartment." The two suites could be used as apartments but a better description is "suite." Suite #2 has a Queen bed. Small kitchenette area with a microwave, bar-size fridge, two burners, electric coffee maker, purified water. Wireless internet. Small TV with Mexican cable and a DVD player with a large library of DVDs. Suite #2 also overlooks the flower-filed garden. Lovely bathroom with spacious shower of green and white Mexican tiles. High quality linens and down comforters. reading lamps by bed. Both suites have their own outdoor patios for sipping morning coffee or a glass of wine at sunset. Comfortable lounge chairs for outdoor reading and relaxing. Location! We are a 20 second walk to the main mercado where you can buy fresh fruits and vegetables and flowers. And at 8:30 in the morning, freshly baked bread. A minute away is the beginning of the artisans market where Mexicans sell their jewelry, crafts, native clothes, etc. We are within an 8 minute walk to 90% of the restaurants that one would frequent. Our suites overlook a beautiful garden. You have lots of light and privacy. We are a FLAT walk to most places that you will visit. The suites are private with outdoor seating. We live on the second and third floor. You enter our compound and walk through the entrance way to the garden in the back of the property. Should you want any help, we are close and can aid you. BUT, we leave guests all the privacy they desire. You have at your fingertips our 18 years of experience in San Miguel. We are always willing to share our secrets of San Miguel. Beautifully tiled with Mexican tiles. Location can't be beat! This is a walking town and you'll find most things that you need within 1 to 15 minutes. Flat walking. Hosts will provide information about the best restaurants and shopping in town. (In fact, we supply a 4 page list for you - a very subjective list based on our tastes and having lived here for 14 years.) Hosts also will arrange masseuse who will come to your suite for a mere $35 for a one hour session. (She is EXCELLENT!) Purified water system throughout the property. Wireless internet connection in each suite and in the garden. Pressurized water system. Cable TV with American channels. Guests have full use of the garden and each suite has its own patio with a table and chairs for dining and a lounge chair for reading outside. Use of our long distance phone to call the states and Canada for free. Gas heater for the winter months. Fan for the summer months. Maid service 6 days per week. DVD player and many dvds provided in each suite. Beautiful space. Great location. Wonderful host. We will probably be back! Great stay and the suites have terrific appointments. An unassuming doorway opens to a spectacular courtyard garden. Great location. Great massage by the fountain. All-around great stay. Thank you, David! Thanks Sally, come back any time. Being a first time at VRBO, I felt David was very accommodating and helpful with information. We had a great time as this house was very relaxing and peaceful with a lot of local character to it. Also, we were very close to most locations and especially the Mercado that was just a stone throw away. My husband and I stayed in Suite #1 for five nights in March, 2018. As soon as our host, owner David Cross, opened the main door for us, we knew we would be happy here. Our suite was just a few steps into the flower-filled courtyard. Beautiful. Everything worked – refrig., shower, hot water, tap water to drink, all of it was in perfect working order. It felt very private, too, and safe. And the decorating! So many wonderful touches. I echo other reviews in that it is a short walk to Ramirez Market and just a bit farther to the Jardin, the center of town. Even though just a few blocks to Centro, it was quiet (well, except for the church bells which can be heard everywhere). David was fabulous, helpful if needed, and friendly. We hope to return for a longer stay in 2019. These guys are great interesting and fun. I recommend them to any host band I hope they come back next year. Wonderful to wake and have coffee outside in the private garden listening to the birds. The instant you enter the House of Flowers you know you have found your way to an extraordinary place. Everywhere you look there is art, color, texture, light and, of course, flowers. The suites offer a sense of living in the midst of a garden by way of their large arching windows that open to a central courtyard filled with cascading bougainvillea, fruit laden trees and busy hummingbirds. On a more practical note, the location is ideal, just steps away from the market and an easy stroll to the Jardin or central square of the city. If you’ve traveled in Latin America before, you’ll also be pleased with the purified water available throughout the suites, the abundant hot water and plumbing that works! 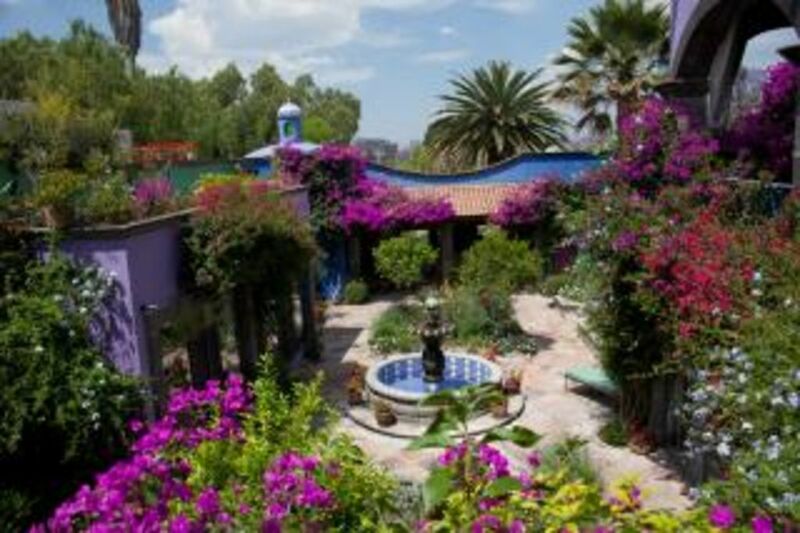 Another feature of the experience at the House of Flowers, to rival its beauty, is the generous hospitality offered by David, the owner of the property. Whether you’re in need of a general orientation to the city or on the hunt for the perfect croissant or cup of coffee, he’s there to assist. Though I’ve been to San Miguel many times before, I was delighted to be introduced to even more wonders of Mexico and this fascinating city. I will return. May it be soon. It's easy to be a good host when you have guests like this. After the first day it was like we were old friends. I can't recommend her highly enough. hot springs, horseback riding, hot air balloon rides. trails begin 10 minutes from the property. the jardin-the main square- and people watch. Nightly Rate: $95 - $105 Weekly Rate: $665 - $735 Monthly Rate: $2660 - $2940 Suite #1 rents for $105 per night. Three night minimum. Full week is $735. Suite #2 rents for $95 per night. Three nigh minimum. Full week is $665. There is one tiny room with a double bed on the property. That is only available to renters of either Suite 1 or Suite2 and the cost is $60 per night. This is for additional guests who are friends or family or renters in Suite 1 or Suite 2. All guests have use of the entire garden area. The location of this property cannot be beat! Only a 5 to 6 minute FLAT walk to the jardin --the absolute center of town around which everything happens. Located on a charming street near the main market of town and next door to the main craft vendors of San Miguel. The calendar option on this website is a little deceiving in that we have two suites and the calendar only reflects when both suites are occupied. Please contact us for availability.